Six word story captures the attitudes these pelicans had toward me as I approached the pier. They gathered together, sauntered to the edge, looked at me, and the middle one kept reaching out to bite me! So, we reached detente -- I could take their photo, but could not enter the pier! Wow - they look pretty intimidating. Great capture! What a menacing trio! Love their postures and expressions. Ha ha, That's funny. Nice shot. I love love LOVE pelicans!! I saw some white ones today but they were too far away to photograph. Great capture! I like seeing them from this angle! What funny faces and I do agree with you! If only they spoke English, what would they say? Incredible picture and fierce looking pelican. Great capture, they look scary. well this is just wonderful ----------I absolutely adore pelicans but this trio of Mafia bouncers is just wonderful - FAV!!!!!!! Fav...your title is perfect. What a great shot! Congratulations on making Trending Page. Well deserved. Great title, caption, and image! Well done Taffy! Brilliant capture of the birds...the pelicans have attitude! Oh my...this is very dramatic! Like they are alien creatures.wonderful! Looks like an ad or video; "This is my hood!" Like much! Had to fav because it made me smile. You were definitely in the wrong 'hood here! Nice one! I'm so glad to see the pelicans back. For a while there, you never saw them anymore. Now I see flocks every time I'm back. Great portrait capture! I love these guys with their yellow heads and beady eyes on you. Great capture. A fav. "You shall not pass!" What a great image Taffy, love the colours and expressions, fav. Looks like a painting. Nice work..
Lol, I wonder what they are guarding! Great facial expressions. Fantastic capture! Love the attitude (well, from a distance). Awesome capture and detail. A hilarious story. Amazing shot, your pelicans are quite different from ours - and kind of fierce looking! Fav. I wouldn't argue with them........I heard they are very lightweight for their size. Oh, these are wonderful! Fav. Great choice getting low for an eye to eye photo. It is amazing watching them interact with people on piers, including trying to steal bait from fishermen. Fun foto and fav. I just love this shot Taffy, and it looks even better enlarged, a fabulous capture and a fav. Can't decide whether I can laugh at them or whether I should just run away from them. Absolutely brilliant photo. It looks as though it could be from a Pixar Animation. Superb shot. It looks like you are off the pier, here! Haha this makes me smile. Part hilarious, part imposing. Well done. This is a riot! Fantastic (and brave) capture. Thanks for sharing such an enthusiastic comment on my macaw picture. Appreciate that. Fantastic capture, love it ! Very cool capture and love the story!! fav! Congratulations on making PP. Well deserved. Fabulous capture! What wonderful birds they are! Bit scary though! Fav! lol They do look kind of bossy..lol Fav! Wouldn't dream of crossing that line........great shot. This is an awesome photo. Fav! 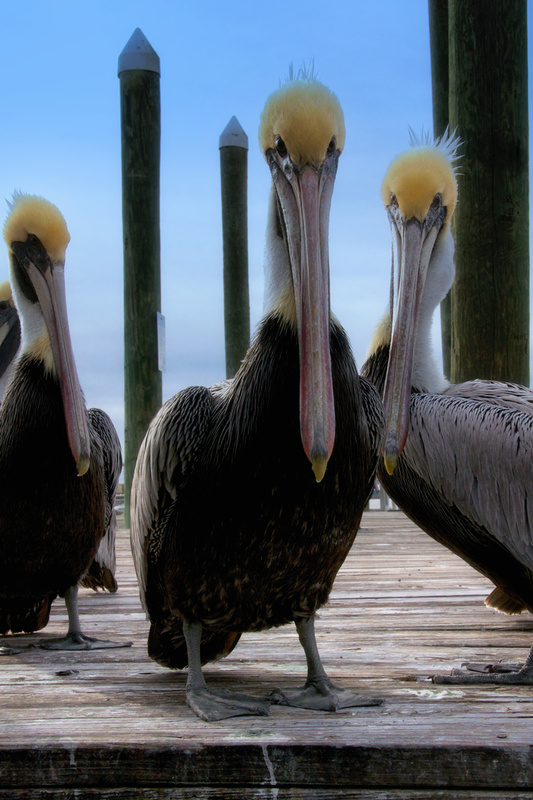 Pelicans with attitude ... love it! Love this! How'd you keep them still like that? @chellek14 Heehee! Love your question! Well, we just chatted a bit, and they agreed to pose, as long as the one in the middle was allowed to continue to try to bite me!! That, and a fairly fast shutter speed! You are on a roll. Double TT again? Wow. This one is really fun. This really puts a smile on my face! Congrats on the double TT, Taffy!